LEGO Creator Modular Family Villa Building Kit - BEST Price! Home Toys & Games Building Toys LEGO Creator Modular Family Villa Building Kit – BEST Price! LEGO Creator Modular Family Villa Building Kit – BEST Price! My family buys these larger sets and puts them together during Family Night! It’s cheaper than taking the kids to the movie! Hurry and get the LEGO Creator Modular Family Villa 31069 Building Kit (728 Piece) today for only $44.99 (Regularly $69.99) from Amazon! This is the best price ever on Amazon! Check out all of the recent Amazon deals here! Enjoy urban adventures at the 3-level Family Villa, featuring a red-tiled roof, white facade with lots of windows and colorful details, plus a garden area with a basketball hoop, outdoor fireplace, mailbox, doghouse and a stairway that leads to a mid-level terrace with a sun lounger. Interior details include a bedroom and kitchen, tables and a sofa. Mix and match the buildable modules and easily swap the window, door and other modular sections to customize the house with the new-for-June-2017 LEGO Creator modular system. 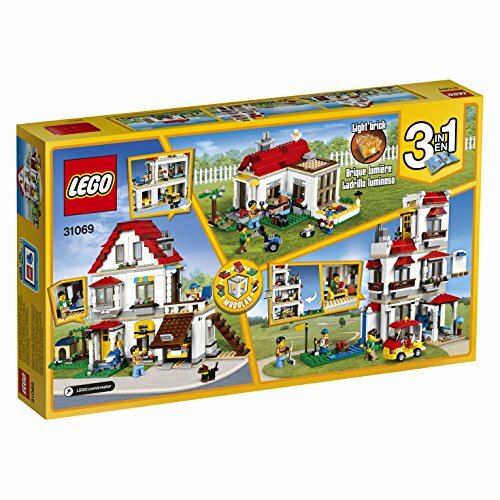 Combine this set with the 31067 and 31068 modular-system sets to create a dream house with endless build and play opportunities! This 3‑in‑1 LEGO Creator model can also be rebuilt to create a Golf Hotel or a Summer Villa with a swimming pool. Includes 3 minifigures. Previous articleIdeal Hot Potato Electronic Musical Passing Game – 50% Off!